"Ocha Nigosu." (C)Nishimori Hiroyuki/Shogakukan Inc. Autumn has long been considered a season for cultural pursuits in Japan. With its cool, pleasant weather, this is the perfect time of year for getting involved in the arts. In the past few years, a series of manga about school students enjoying traditional pastimes such as the tea ceremony and calligraphy as part of their extracurricular activities have become bestsellers, and more young people are becoming interested in traditional pursuits as a result. As Passionate as SportsUntil recently, a typical manga aimed at young readers would be set in a school sports club, its storyline focusing on the friendships and rivalries among team members. Over the past two or three years, however, comics have started to appear whose main characters are involved not in baseball or basketball but in traditional cultural pursuits not usually associated with teenagers. These include shodo (brush and ink calligraphy), the tea ceremony (in which green tea is prepared and served according to strict rules of etiquette), and rakugo (traditional comic storytelling). The manga "Tomehane! Suzuri Koko Shodobu" (Suzuri High School Calligraphy Club) currently being serialized in the magazine Big Comic Spirits (Shogakukan Inc.), is a comedy featuring a high school student who returns to Japan from overseas and joins the calligraphy club at his new school. The story follows the students' determined efforts to be chosen for the International High School Shodo Exhibition, known as the "Koshien of Calligraphy" after the prestigious high school baseball tournament held every summer at the Koshien stadium near Kobe. As well as showing the students learning the basics of their hobby, there are also scenes featuring innovative "performance calligraphy," in which the students dance as they use thick brushes to daub characters onto huge sheets of paper. Real students from schools regularly nominated for the International High School Shodo Exhibition help draw the calligraphy that appears in the comics, and the students themselves appear in the performance scenes. The exhibition takes place every year; this year students from 23 foreign countries took part, as well as budding calligraphers from schools throughout Japan. Performance calligraphy is a world away from the quiet image of traditional calligraphy, and some youngsters become deeply engrossed in it. The popularity of performance calligraphy has spawned national competitions and led to performances being shown on TV. 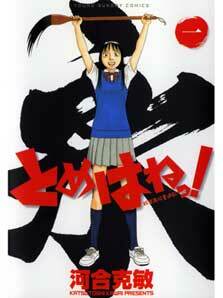 The calligraphy manga will be serialized as a TV drama starting January 2010. Card CultureAnother bestselling manga is "Chihayafuru," winner of the 2009 Manga Taisho (manga of the year prize) voted for by manga-loving bookstore employees around Japan. "Chihayafuru" has been serialized in the Be Love women's manga magazine published by Kodansha since 2008. The manga tells the story of a high school girl and her friends in the after-school karuta (Japanese playing cards) club. The story's heroine becomes engrossed with a traditional karuta game played with cards featuring the One Hundred Poems by One Hundred Poets, a famous compilation of Japanese waka poems compiled in the thirteenth century. In the game, one person reads the opening line of a poem while everyone else competes to find and pick up the card inscribed with the rest of the poem as quickly as possible. "Ochiken." (C)Kawashima Yoshio, Futabasha Publishers Ltd.
As well as being an entertaining story of the friendships and rivalries that develop as the girls pit their skills against one another, the manga is also a mine of information on the meaning and history of waka poetry and a fun way for readers to learn about classical Japanese literature. Karuta games can get extremely competitive, with players trying desperately to outpace each other. It is enjoyed by people of all ages, and keenly fought championships to find the "king" and "queen" of karuta are televised every January. Competition is so intense that competitive karuta has been described as a martial art fought on tatami instead of judo mats. 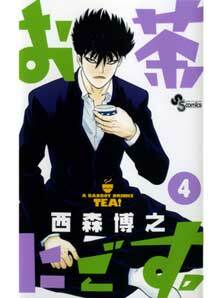 Another example of a popular manga dealing with an unlikely traditional subject is "Ocha Nigosu" (A Bad Boy Drinks Tea! 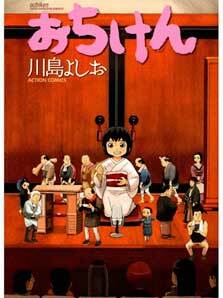 ), about a school rebel who learns maturity and good behavior thanks to the tea ceremony. One of the pinnacles of traditional Japanese culture, the tea ceremony teaches the tenets of proper etiquette and respect for others.